We’re a nationally recognized web design, development, and optimization agency with nearly 20 years of experience working with clients in NYC and beyond. Since 1999, we’ve specialized in crafting custom web designs and effective marketing strategies for our clients. Simply put, our mission is to help our clients hit their goals, regardless of where they operate in the world. From responsive web development to search engine optimization, we have the depth in our services and talent to get the job done. It was an ambitious digital rebranding requiring rich expertise in content strategy, an intensely collaborative client-agency partnership, and a flexible content management system to empower team members across the globe. In recent years, Skyhigh Networks has expanded rapidly and required a versatile website that reflected its brand and growing dominance in the increasingly crowded cloud application analytics space. Taskstream is a client in the ed-tech business, and we launched their new website in January 2017. 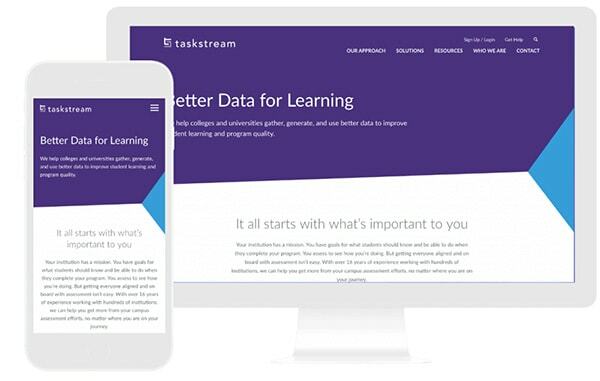 Taskstream offers cloud-based assessment tools that help colleges and universities gather, generate and use better data to improve student learning and program quality. Since they have a range of offerings, the biggest challenge was to quickly guide the website visitor to the appropriate section of the website, without overwhelming them with incomprehensible industry jargon. Our two teams forged a strong partnership that’s a win-win for everyone. Our process is simple, we listen before we create then we measure and repeat. We refine because we’re never satisfied. We test, hone, and customize our process to better suit your specific goals, and we work to redefine the digital experience in your industry. We don’t only listen to your needs, we dive deep into historic performance data and identify what works and what doesn’t. This fuels our information architecture, content strategy, and design. We don’t have to create the content, but we’d like to. They are many benefits of hiring a copywriter to write your website copy but to keep this paragraph short and to the point, we provide an outsiders perspective and have years of experience writing for the web. Designing websites have been our bread and butter since 1999, and we’ve been pushing web design boundaries since. Over the years we’ve developed a process that helps us efficiently design websites that capture your audience’s attention and guide them down the conversion funnel. We meticulously develop adaptable, responsive websites that are simple to update and customized for each client’s specific needs. Additionally, we’ve helped our clients develop custom plugins to streamline content updates and easily track problems, users, actions, and more. We continue to work with our clients post-launch on digital marketing efforts, web design changes, development improvements, or simply keeping their website up-to-date with the latest browser and security updates.